5 Reasons You Need a Guide to Hike Lion’s Head. Lion’s Head is a magnificent trail, one of the best known in South Africa. The trail is a rugged terrain with multiple routes and drastic weather changes during all seasons. The Lion’s Head hiking trail is better described as a gentle hike however the comparison for Lion’s Head is the more difficult Table Mountain. When describing a route as easy to a foreigner, most locals do not have a fair idea of the available hikes in the country of origin for the traveler. For example, someone who comes from Netherlands can only imagine what it means to have a hill, let alone a mountain like Lion’s Head. The same applies for someone from the northeastern United States. New York is fairly flat when compared to the mountainous landscape of South Africa. The closest thing that these two nationalities would know in common would be the stairs master at gym! When you first travel to Cape Town, you will notice that the landscape is a beautiful balance of mountain and sea. The mountains surround the city of Cape Town, sheltering it’s population of approximately 4.33 million people from the high winds and other natural phenomenon. 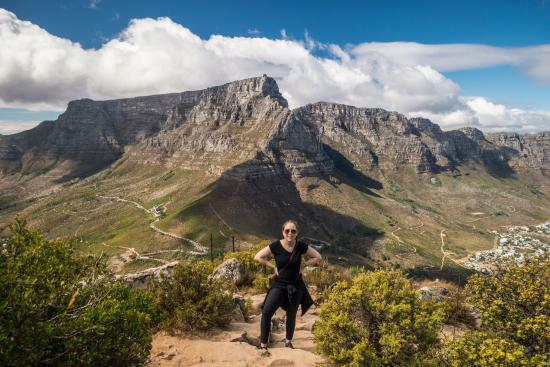 There are 10 reasons why you need to hire a guide for your hike up Lion’s Head. It is suggested to read over the points below and make your own choice. If anything remains unclear then why not give us a call? We’d be glad to help with your booking and providing any more information that will make your hiking experience with us the best. Muggings have been reported on Lion’s Head. No this doesn’t mean some fancy thing for coffee tasting or tea. This is serious stuff and your guides are familiar with what an unkosher character looks like. We even have prepared with emergency numbers and have confidence that you will find hiking with us much safer. Do you know what to do in case of emergency? There are numbers you dial in case of emergency. We recommend doing the research about who to call when things go south. If you are one of those people who want a little more comfort in knowing that your interests are taken care of then rather book a Lion’s Head guided hike. You wont regret it. Our hikes are proclaimed to be the best. (But that’s just a legend) Click here to read our TripAdvisor rating. Routes are planned to avoid certain aspects of the trail. There are certain parts of the trip that you just don’t want to see “this fall”. This play on words is not Shakespear, you would really want to consider choosing the right route that works for you. If you have a fear of heights, no problem. If you prefer more scenic routes, also no problem. Hike Lion’s Head caters to all types of personality types with different routes. It gets dark and cold up there quickly after sunset. When the sun goes down. The dassies come out to play. The dassie is a type of aminal that likes to live on the mountains of Cape Town. If you hike with us you might see one of these creatures. They look like giant hamsters except that they are actually a relative of the elephant. More seriously, you will want to consider the weather on Lion’s Head. It is not uncommon for the temperature to drop from 23-13 degrees in a matter of minutes. The wind picks up and you are left shivering in your boots (Or running shoes). Let us do the planning for you to see where the weather conditions meet the hiking times to execute the best hiking plan. Fun fact. It’s more fun to hike in numbers. Our guides are more interested in having a good time with you hiking than worrying. However because it would be the duty to ensure safe journey to all hikers with us, the guides keep an open mind on the safety as well as the inherent dangers. Please let us do the planning to take your mind off the smaller things that might effect your hike. Hiking solo is not recommended for the above reasons and we hope that you find use of our excellent guides. BONUS: Transport is included in your package. If you stay in Cape Town Central there is no reason to drive on the opposite side of the road. Let us do the driving for you like you personal chauffeur or mother, whichever you prefer.